When your setup requires installing your cable behind a wall or ceiling, this is the best performing cable that also passes building codes in the USA. It is made of 99.99% Oxygen-free copper and includes a layer of foil shielding to prevent unwanted interference and hum induced by surrounding electrical wires. The CL3-rated outer-jacket is UL listed and meets all building codes in the USA for fire retardancy. It does not include the CSA mark and therefore may not pass inspection in Canada. Run this 2-conductor cable (+ and -) to a single speaker. Speaker cable is made of individual strands of copper that are twisted together to result in the cable's thickness, or gauge. The lower the gauge, the thicker the cable, e.g. 14 gauge is thicker than 16 gauge. Generally speaking, thicker cable will result in less signal loss over a given length. We recommend using 14 gauge cable because it offers the best performance to cost ratio. While using thicker cable will, in theory, produce less signal loss, the difference is so insignificant that your ears will likely not be able to tell the difference. It is also important to know the number of individual strands that are used to produce the overall gauge. Electrons will follow the path of least resistance which tends to be on the surface area of the copper. So the more individual strands used, the greater the available surface area, and thus less signal loss. Typical CL3-rated 14 gauge speaker cable that you'll find at consumer electronics stores is manufactured with a strand count of 16. In contrast, our HTD clear-jacket cable utilizes 63 individual strands of 99.99% oxygen free cable. Some popular cable manufacturers also use this high strand count but they will cost you about double our prices simply because they sell through distributors and retailers. With the recent rise in the price of copper (due to strong worldwide demand), the amount you'll spend wiring your home for sound has become a significant part of your home audio budget. Choosing HTD speaker cable gets you the quality you need at a price that won't break your budget. Please note: The jacket color for this cable is black for all spools of cable. Cable sold in bulk box (i.e. 500 feet) has a gray jacket. A powered subwoofer, by definition, includes an amplifier. The signal sent from the home theater receiver/processor to the subwoofer amplifier is therefore a "non-powered" signal that needs to be shielded from its surroundings. Shielding prevents unwanted interference, specifically a 60 Hz "hum" from nearby electrical wires, from being picked up and amplified. We offer a shielded powered subwoofer cable in lengths of 3 feet, 12 feet and 30 feet. The other speakers in a surround sound setup (front left, center and right plus all of the surround speakers) do not have amplifiers built-in. Instead, they are powered by amplifiers in the home theater receiver. It is difficult for an amplified signal to pick up interference, so regular, unshielded speaker cable will do. Regular speaker cable is also what is run between the subwoofer amplifier and the subwoofer. We recommend 14 gauge cable because, in our experience, it is difficult to notice an improvement with even thicker cable. When running cable behind a wall or in the ceiling, most building codes will require that you use UL rated CL-3 cable which has a higher fire retardancy than clear jacket cable. What type of cable should I use for my in-wall speakers? 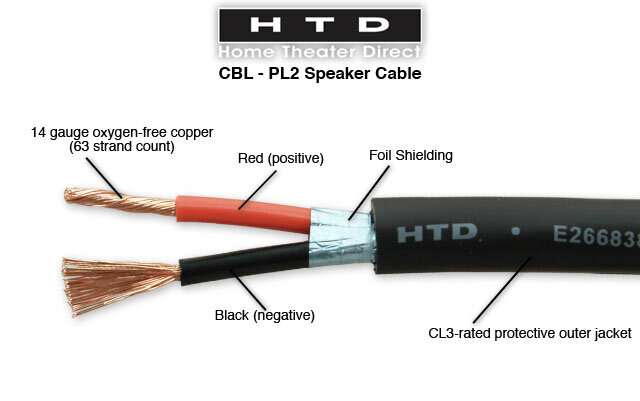 Click here to purchase HTD speaker cables. HTD Multipurpose in-wall speakers can accept 14 gauge cable but 16 gauge should also work well for most installations where individual lengths are less than 100 feet. The High Defnition in-wall speakers can accept 10 gauge wire, but 14 gauge seems to be the point of diminishing returns for most listeners, i.e. you can spend more money for 10 or 12 gauge cable but you probably won't hear the difference. While clear jacket cable is suitable for most in-room speaker installations, if you are running cable behind a wall or ceiling, you need to use UL Class 3 rated cable to be in compliance with most building codes. Class 3 cable will not degrade in extreme temperatures because it uses an extra plenim sheath to protect the cable. The letters CL3 should be printed somewhere on the sheath. Good cable will make a difference in the performance of your speakers but you shouldn't have to take out a second mortgage to get them. Most speaker cable is simple in design because it carries a hi-level or powered signal so it does not require much "shielding" to protect it from interference and hum. On the other hand, audio interconnect cables transmit a line level or non-powered signal from one component to another (such as from a DVD player to a receiver or from a receiver to a powered subwoofer) and are at high risk for interference and thus require a good amount of shielding. 1. Oxygen Free Copper should be used. Copper of 99.9% or higher concentration is used in most speaker cable today, but to officially be considered "oxygen free", it should be 99.99% pure. Extra, and more costly, processes are used to get to this level which is one reason speaker cable is more expensive than typical copper cable. Look for the letters "OFC" printed on the cable or packaging. Poor quality copper will deteriorate fairly quickly and the conductivity can be reduced to the point that it is noticeable in the speaker's performance. 2. The thicker the cable, the better. A cable's overall thickness is measured by gauge. The lower the gauge, the thicker the cable. HTD recommends using 16 gauge or thicker cable. In general, the longer the cable run, the thicker it should be to minimize signal loss. While Level TWO and Level THREE cabinet speakers can handle down to 8 gauge cable, we have found that the point of diminishing returns seems to be around 14 gauge for most listeners. This means that it becomes difficult to justify spending significantly more on thicker cable for the tiny amount of improvement in speaker performance- an improvement most listeners won't detect. 3. The higher number of strands used to produce the gauge of the cable the better. Speaker cable typically consists of many small wires twisted together. Because electrons flow along the surface area of the copper wire, more surface area means less signal loss. And more strands means more surface area. Further, something called "gap flux" that occurs between strands needs to be minimized and the closer together the strands the smaller the gap flux. HTD offers a complete line of quality speaker cable that excels in all three points discussed above.